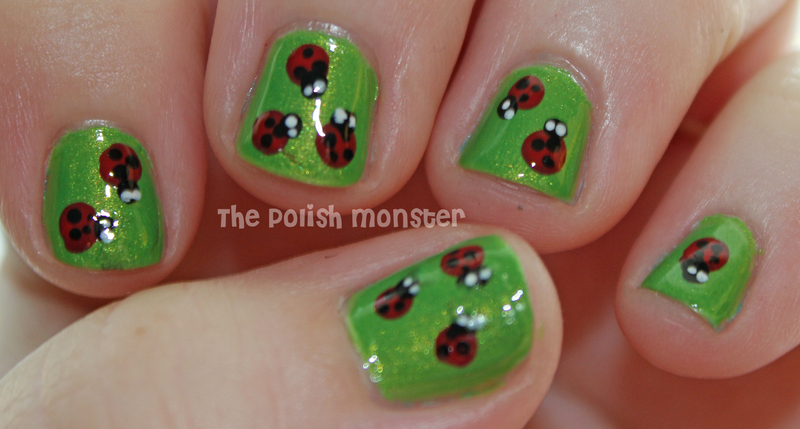 Ladybug, ladybug, fly away home; Your house is on fire and your children all roam! 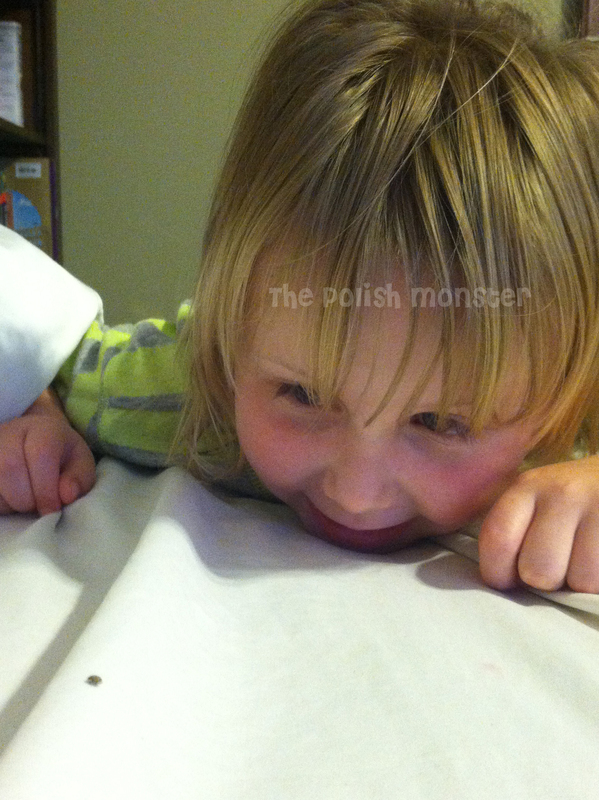 The other night my husband spotted a baby ladybug on our bed. My daughter LOVES ladybugs- in fact, her nickname from my mother-in-law is ‘Nana’s Little Ladybug’- so of course we called her in and she spent a good chunk of time staring at it. 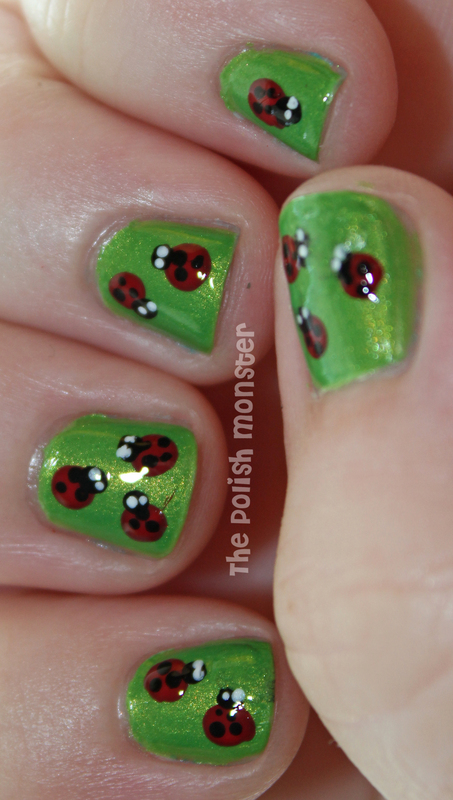 So when I was trying to decide what to do for today’s Mani Monday, I remembered the little visitor and decided to do ladybug nails! Nail polish, and dotting tools. 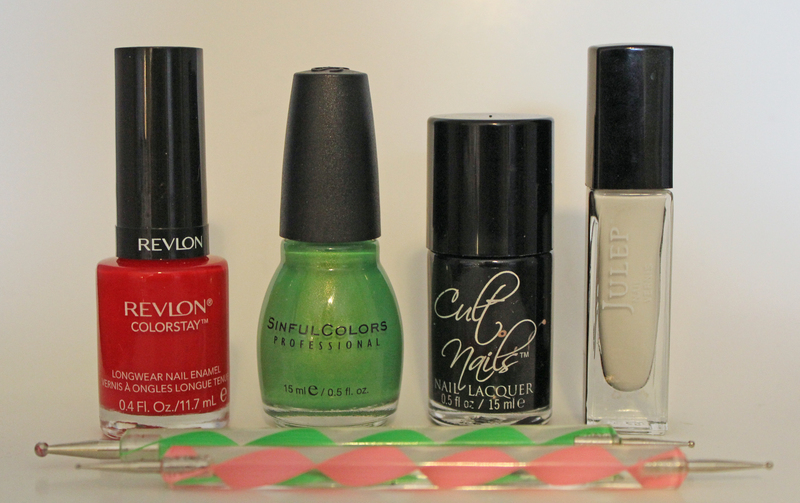 I used Revlon Colorstay in Red Carpet, Sinful Colors Happy Ending, Cult Nails Nevermore, and Julep Kate. You can use whichever colors you like! I got my dotting tools for super cheap somewhere on Ebay from China, but you can find them in a lot of places. If you need help locating some just leave a comment! First off, I painted each nail with Happy Ending- this was my closest ‘grass’ type color, and I hadn’t used it before so I was glad to have the chance. I had never noticed this color before, but I think it’s part of some core lines of Sinful Colors? Most of my stores don’t carry it, but I noticed it as part of the standard larger display at Rite Aid. I really like it! This was almost a 1 coat polish- I added a second coat to make the color a bit brighter. I also had NO CLEANUP. I did my nails last night and took the photo this morning… and I didn’t have to touch up a thing. I honestly think that’s a first for me! I don’t know if it’s a testament to the polish, or to my increasing skills with a brush! Super quick, easy, and cute! I struggled a little more with my right hand because I have issues keeping my left hand steady… but it still looks decent! Hope you enjoy! If anyone decides to recreate a similar look, please share pictures on my Facebook page! This entry was posted on July 9, 2012 by The Polish Monster. It was filed under Uncategorized and was tagged with Cult Nails, dotting, Julep, Mani Monday, nail art, Revlon, Sinful Colors. What an amazingly sweet idea! I love the look of the bugs in the grass. If you didn’t tell us, I’d never have suspected it was so simple. Looks great! Thank you for this one! You’re welcome! It was INCREDIBLY easy- I really reccomend a dotting set to everyone (though this was, admittedly, my first time using mine!). There’s so many different looks that you can achieve just by having various sizes! How cute!! I really love that green you used too. I don’t have any greens, so I’ll keep an eye out for that one too. I got my dotting tools on Amazon, but yours are way cuter 🙂 Mine are just plain ol wood – perhaps I should decorate them! Omg, this is possibly the cutest thing ever! I like it a lot, I will have to try it myself. What did your daughter think of your manicure? I bet she wanted one too! Oh my gosh, she loved it! She’s overly dramatic, so she (literally) cried the next day when she saw I removed it. Bless her heart!